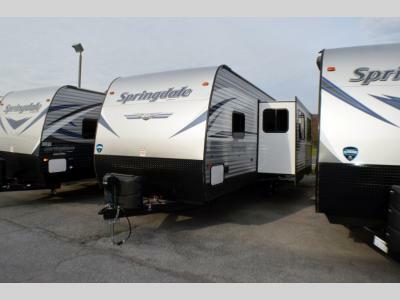 You will love camping in this comfortable Springdale Keystone travel trailer model 274RB. The cook in the family will love having this kitchen and the walk-in pantry for all of your non-perishables. There is even a small fridge outside for a few drinks, so you don't have to walk all the way back into the trailer for a cold beverage. You can even put up the adjustable power awning for a rest in the shade in the great outdoors. 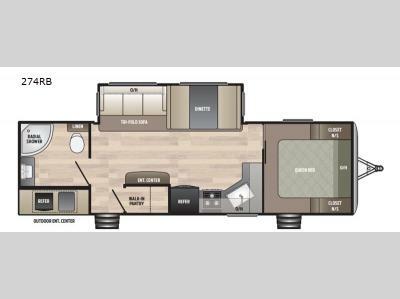 Once your adventures are done for the day, you can fall asleep in the private front bedroom. There is a booth dinette and tri-fold sofa that can be used for relaxing, eating, and enjoying one another's company.